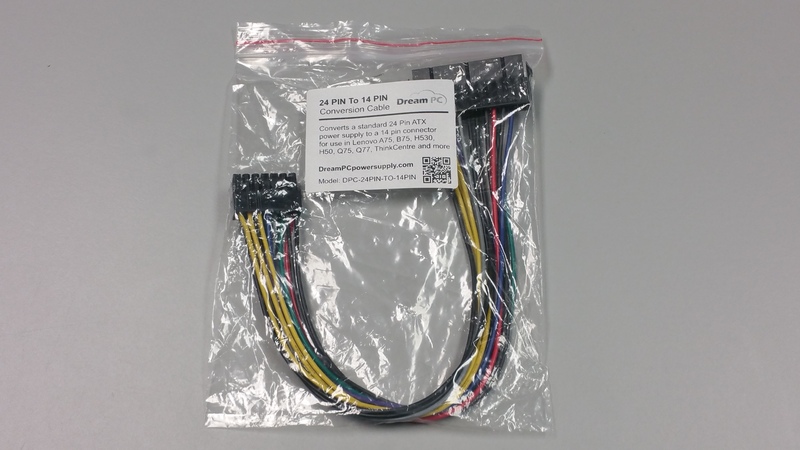 Converts a standard 24 Pin ATX power supply to a 14 pin connector for use in Lenovo A75, B75, H530, H50, Q75, Q77, ThinkCentre and more. One connector connects to the ordinary 24 pin ATX power supply, the other connector connects to proprietary 14 pin connector used on Lenovo, IBM and Dell. Dream PC is proud to announce our new Stratus 400 Watt ATX Power supply. Featuring specific AC input plug placement and flush mounted for the widest range of fitment, thicker metal, thicker gauge wire, longer cables, additional connectors, dual fans, quality packaging and a company that stands behind its products! This Works as both 20 pin and 24 pin Main Connector; simply slide the 4 pins off the end of the connector. If your motherboard requires it you can use it, If it does not require it, you do not need to use it. These are used to power newer style hard drives, optical cd/dvd drives, graphics cards, etc. These are used to power older style hard drives, optical cd/dvd drives, graphics cards, etc. This is used for the older 3 1/4 inch floppy disk drive or other types of accessories.